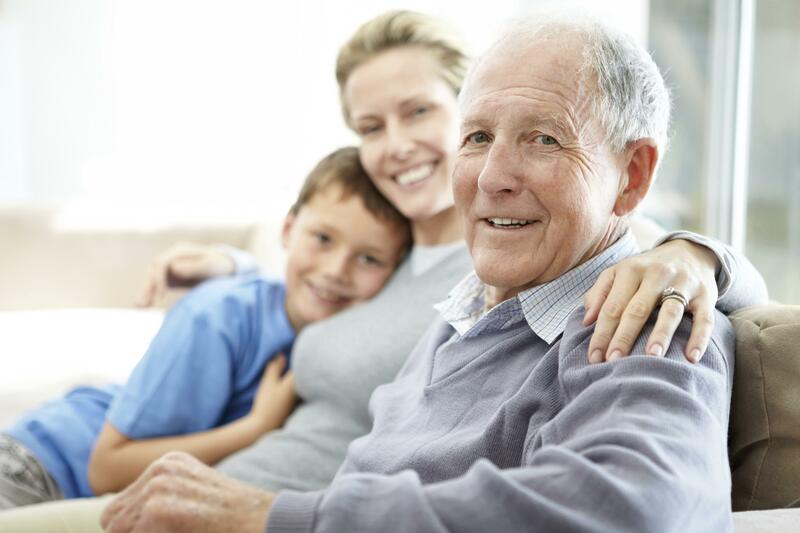 Alzheimer's disease is a neurodegenerative disease evolving over several years. During this period, the circle of acquaintances often has a key role to be played in the care of the sick person. A responsibility which entails stress, tires, anxiety, even depression and disease. " To help the caregivers " is thus a priority. Brochures, web sites exist, but this is generally static and standardized supports and thus little contextualized in specific aspects to every situation. Contributions of this project will be, at a theoretical level, to improve the knowledege of Alzheimer family caregiver's burden, and at a practical level, to create a serious game able to help caregivers to improve their communication skills. Project Leader : Nicolas Szilas, Frederic Ehrler. Project members: Mireille Bétrancourt, Urs Richle, Anna Laura Luiu, Lucie Chauveau. The Citizen Cyberlab is an EU ICT project funded under the 7th Framework Programme. The Consortium Team consists of seven partners: the European Organization for Nuclear Research (CERN), the United Nations Institute for Training and Research (UNITAR/UNOSAT), Imperial College (ICSTM), University College London (UCL), Université de Genève (UNIGE), Université Paris Descartes (UPD), and The Mobile Collective (TMC). The central focus of this research is creativity and learning in on-line citizen science. Beyond helping scientists execute laborious tasks, Citizen Cyberscience projects enable citizens to learn about science and take part in the more creative aspects of research. Little is known about the learning and creativity processes stimulated by such projects, even though millions of volunteers participate. Even less is known about how to optimise those processes. The use of 3D as a new narrative media has generated much research. In the field of Interactive Storytelling, in order to empower users to exercise a strong influence on the narrative the upcoming narrative events must be dynamically generated using Artificial Intelligence algorithms. But what is a narrative event in an interactive context? Which narrative situations might have an important impact in users during the interaction? The theories of narrative resulting from the study of classical linear narratives are unable to provide a complete answer to this question. As a result, this project aims to fill this gap through a series of experiments, using interactive narratives developed specifically for the project, in order to accurately assess at every moment the quality of the user experience and to determine the relevance of the presented narrative acts. Project Leader : Nicolas Szilas. Project members: Mireille Bétrancourt, Urs Richle, Fabienne Salamin, Sergio Estupinan. 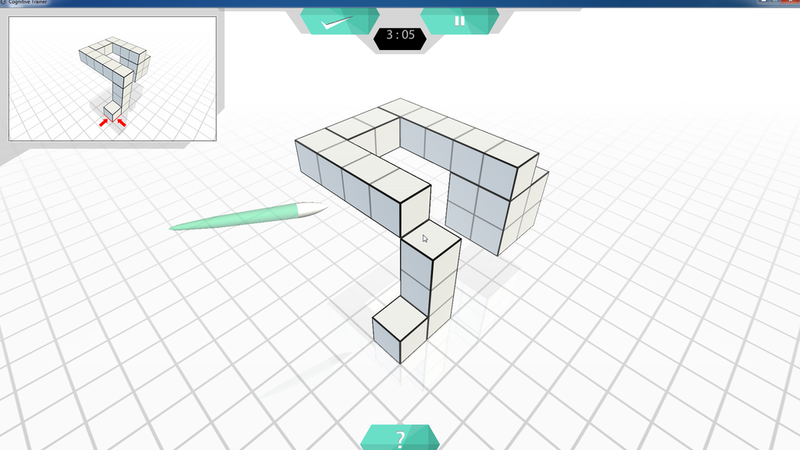 The Spatial Cognitive Trainer (SCT) project is a 3D real-time simulation software intended to support training, assessment and specialization of complex mental processes, by the use of both haptic and 3D visual simulations. Built on idtension, a highly interactive drama engine, an interactive game is developed to help youth cope better with parents or siblings who had traumatic brain injury. Site du cours 74111 : Podcasts du cours + podcasts de la collection "Penser l'éducation: concepts-clefs"
Ce site permet aux utilisateurs d'avoir un accès aux podcasts de la collection "Penser l'éducation: concepts-clefs". Les avancées en matière de récits interactifs permettent aujourd'hui d'appliquer ces technologies dans des environnements d'apprentissage visant l'acquisition de compétences relationnelles et sociales. Dans le cadre d'un projet financé par le Fonds National Suisse de la Recherche Scientifique, nous souhaitons aider les personnes vivant avec un patient atteint de la maladie d'Alzheimer à mieux gérer leur relation quotidienne avec ce dernier, et ce en s'appuyant sur des techniques de récit interactif. Il s'agit de générer dynamiquement à la fois les événements se déroulant dans la « simulation narrative » et les possibilités d'actions qui s'offrent à l'utilisateur. Plus particulièrement, nous souhaitons pouvoir personnaliser finement la situation initiale et le déroulement de la simulation en fonction des caractéristiques générales de la situation (lieu, âge des acteurs, professions, handicaps physiques, etc.) et des caractéristiques comportementales du patient. Julien Da Costa - Conceptualisation des phénomènes éléctriques et magnétiques à travers les dispositifs de réalité mixte. De nombreux travaux en didactique des sciences indiquent que les étudiants disposent de connaissances parcellaires sur les concepts de base de l’électromagnétisme, abordent l'apprentissage des phénomènes électriques et magnétiques avec des représentations alternatives aux modèles scientifiques, utilisent des définitions et des formules mathématiques routinières sans réelle compréhension conceptuelle. Les concepts en électromagnétisme sont complexes et impliquent des relations abstraites « dans un monde où toutes les quantités sont invisibles » (Chabay & Sherwood, 2006). Les étudiants ont des difficultés à appliquer les lois physiques aux situatiations éléctromagnétiques, à faire des connections significatives entre les concepts ou encore confondent les mécanismes en jeux au niveau microscopique avec leurs expériences sensibles au niveau macroscopique. Les dispositifs d’interaction mixte et augmentée possèdent des caractéristiques uniques pour dépasser ces difficultés en permettant la superposition de représentations externes mutliples dans un contexte tangible et authentique. Pourtant, la manière dont les élèves interagissent et pensent avec ce type de dispositif est encore mal connue. Dans le cadre de cette thèse nous développons et testons un dispositif d'expérimentation augmentée des phénomènes physique liés aux concepts de champs éléctriques et magnétiques. Results of large scales assessments (e.g. OECD, 2013) show that, in Switzerland, more than 14% (12% for French speaking Switzerland) of 15 years-old students literacy is not strong enough to allow them to cope with social and work requirements, and that 24% of the students are just above the minimum threshold of competence. According to Kintsch (Kintsch & van Dijk, 1978), text comprehension is enhanced when the level of text cohesion is high, and especially for students with poor comprehension skills (Ozuru et al., 2009) or low prior knowledge (McNamara et al., 1996; McNamara, 2001). Another solution to improve text comprehension is to provide visualizations (pictures, schema, diagrams), which we call here pictures, using the term quoted by Schnotz (2014). Schnotz proposes that a high information overlap between text and picture is more effective to support text comprehension than few or no overlap. Finally, computerized educational resources include not only static but also animated pictures that directly display change over time (Bétrancourt & Tversky, 2000). However, the use of static or animated to support text comprehension as a function of text cohesion has not yet been investigated. In addition, the literature on text and multimedia comprehension is mostly conducted with students in higher education, who usually possess high reading skills. In this project, participants will be students from 15 to 17 years old, in their first year at an Ecole de Culture Générale, with poor reading skills. In the field of Interactive Storytelling, in order to empower users to exercise a strong influence on the narrative the upcoming narrative events must be dynamically generated using Artificial Intelligence algorithms. But what is a significant narrative event in an interactive context? Which narrative situations might have an important impact in users during the interaction? The theories of narrative resulting from the study of classical linear narratives are unable to provide a complete answer to this question. As a result, this project aims to fill this gap through a series of experiments, using specifically-crafted interactive narratives in order to accurately assess at every moment the quality of the user experience and to determine the relevance of the presented narrative acts. The findings of my research will provide a solid knowledge-driven basis for designing systems and story material for Interactive Storytelling within areas such as education, entertainment, communication/mediating of complex topics, and training. Mattia A. Fritz - Emotions in Computer-Supported Collaborative Learning: the influence of Emotional Awareness Tools. Started in September 2015 under the supervision of Prof. Mireille Bétrancourt, the thesis has two distinct but intertwined objectives connected to the EATMINT project (see above in the page). First, the development of an Emotion Awareness Tool, named Dynamic Emotion Wheel (DEW), which is intended to provide emotional awareness both in experimental and ecological settings. Second, the integration of the tool in Computer-Supported Collaborative Learning (CSCL) situations, where the concept of awareness is benefiting from a broader perspective compared to the limited approach of replicating face-to-face collaborative settings. In fact, awareness often refers to spatial-like cues about what a user is doing or working on, whereas current trends in CSCL rather aim at making the partners aware of information (related to the task, to the partners, or both) which is not necessarily observable, even in face to face interactions. In this regard, emotions are known to play an important role both at cognitive and social level and we therefore think that students (and eventually teachers) may benefit from sharing their emotions, as well as being aware of their own and their colleagues’ evolution of emotional episodes during CSCL sessions. More specifically, the thesis aims at investigating under which circumstances emotional awareness may improve collaborative learning, and in which way emotional awareness is best conveyed. The idea is to test different configurations of the DEW – with respect, for instance, to individual vs. grouped graphical representation of emotions – and determine whether different ways of conveying awareness have different effects on group dynamics in CSCL settings. Cette thèse porte sur la conception de jeux vidéo pédagogiques qui promeuvent la construction de connaissances déclaratives et procédurales et aident à une meilleure compréhension de concepts mathématiques sous-jacents, tout en assurant une qualité de l'expérience de jeu. De nombreux auteurs s'interrogent sur la capacité des jeux à engager l'apprenant dans un apprentissage d'ordre conceptuel, qui ne se limite pas à l'acquisition de connaissances procédurales ou à la maîtrise des compétences spécifiques pour mener à bien les actions du jeu. Se pose alors la question de savoir s'il est possible de générer, à travers certaines caractéristiques du jeu (par ex. représentation des concepts, choix des activités, rétroactions du système), un effort mental élevé en lien avec l'apprentissage visé qui va au-delà d'un traitement superficiel des informations intégrées dans le jeu, et qui est susceptible de permettre aux apprenants d'acquérir certains concepts ou d'en affiner la compréhension. Cette thèse propose de s’appuyer sur un cadre théorique combinant les champs de recherche sur les travaux pratiques en sciences, sur l’apprentissage coopératif et sur les technologies numériques pour concevoir et évaluer un dispositif pédagogique qui permette de développer l’intérêt des élèves et de favoriser la modification de leurs modèles mentaux dans le cadre de l’enseignement de la biologie au secondaire I. Nous chercherons également à répondre à plusieurs questions de recherche liées aux éléments de designs retenus. Le serious game d'apprentissage se doit de lier la pratique du jeu à la pratique métier. L'enjeu concerne les concepteurs, les responsables de formation ou responsables des ressources humaines, tous intéressés par la transmission ou l'évaluation des compétences. Mais alors que les serious games convoquent les notions de fiction, d'immersion, de réalisme ou encore de référentialité, ils réactivent des problématiques rencontrées par le cinéma documentaire. Cette thèse propose que les théories et pratiques documentaires puissent servir l'intention pédagogique pour favoriser l'acquisition de nouvelles compétences chez l'utilisateur. Sur le plan cognitif, l'objectif est d'explorer l'apprentissage lié à la confrontation de points de vue divergents (conflit sociocognitif). L'objectif communicationnel associé est d'expliquer la construction d'un interlocuteur capable d'opposer un tel point de vue à l'utilisateur. Notre recherche aboutit à une "grammaire narrato-cognitive" permettant de ne plus cantonner la compétence visée dans la fiction, mais de l'étendre de manière réflexive aux énonciateurs réels. Marcos Aristides, 2015 - Vers un dispositif numérique pour l’enseignement-apprentissage du solfège: convergence de la pédagogie et de la didactique de la musique avec la technologie numérique Toward a digital device for teaching and learning tonal music notation: convergence of pedagogy and didactics of music with digital technology. In this thesis we discuss about a theoretical framework to design and develop a digital tool as a framework for creation of tonal melodies. Since the early 1960s we see increasing the relevance of creativity in music education (Swanwick 1979, Paynter 1970, Shaffer 1986). The research aims contribute in the endeavors to understanding how the creativity - or the creative thinking - can helps students to develop their aural skills. Although the creativity can have several meanings, in the point of view of this work creativity is the capacity to construct a musical object recognizable like such. To do this, we propose a framework to construct melodic contours, a digital device, called LOCREAM, allowing users constructing sequences of segment of tonal melodies with purpose to create melodic contours. The algorithm underlying this device is based on the implicit rules of tonal music (Lerdahl & Jackendoff 1983, Schoenberg, 1967). The last stage of this work consist in observing, according didactic parameters (Brousseau, 1988), if the aural perception of tonal melodies is improved after pupils have constructed melodic contours with LOCREAM. 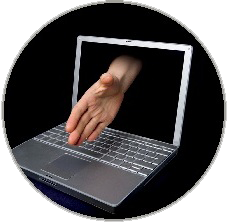 Results indicate that the ergonomic software approach is fair and that it present a great potencial to become an effective learning tool. Cette thèse s'inscrit dans le cadre du domaine de recherche portant sur la réhabilitation d'enfants sourds utilisateurs d'implants cochléaires en collaboration avec le Centre Romand d'Implants Cochléaires (CRIC), une division des Hôpitaux Universitaires Genevois. Dans le cadre de ce projet, nous nous intéressons à deux enjeux principaux. Dans un premier temps, nous tenterons de répondre à un enjeu clinique, à savoir développer et tester un environnement informatisé contenant des exercices de réhabilitation pour une population d'enfants implantés d'âge préscolaire. Dans un deuxième temps, nous nous intéresserons aux formes d'interaction adéquates pour ce type d'environnement et plus précisément à la problématique de l'apprentissage et du jeu dans les nouvelles technologies pour une population de très jeunes enfants. En effet, nous analyserons quels sont les éléments importants à prendre en compte au cours de la conception d'un environnement informatisé pour des enfants d'âge préscolaire. Finalement, nous appliquerons des améliorations au premier programme développé pour les enfants porteurs d'implants cochléaires en fonction des éléments importants retenus de la deuxième étude. Cette recherche développement a pour objet la conception, la mise en oeuvre et l'évaluation d'un design et d'un environnement de formation hybride pour formateurs d'interprètes de conférence. Le design et l'environnement d'apprentissage sont développés à l'aide d'ingénieries pédagogiques à‚Â« whole scale à‚Â» et de méthodes de prototypage rapide. La recherche s'est déroulée sur deux volées, impliquant 55 étudiants, 7 enseignants et tuteurs, un technicien et un conseiller pédagogique. Les résultats obtenus confirment une conception socio-constructiviste et le développement de nombreuses compétences chez les apprenants. Le portail exerce des influences positives sur l'enseignement au niveau de la collaboration, de la structuration des contenus ou du suivi du cheminement d'apprentissage. Les enseignants apprécient la quantité de savoir partagé et la mise en activité et réactivité des apprenants. La conclusion de la thèse présente un modèle et des règles de conception pour des formations similaires, soit des formations d'adultes centrées sur l'activité. 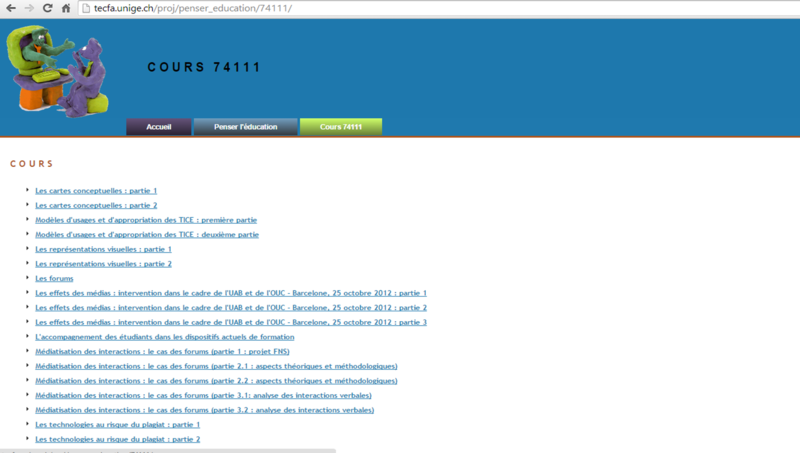 Une des principales annonces du Ministère de l'Education français, pour la rentrée scolaire 2010-2011, a été la généralisation de l'usage -dans tous les établissements scolaires en France- du cahier de textes numérique et la substitution totale des cahiers de textes papiers pour la rentrée 2011. Cet outil fait partie de la culture scolaire française depuis 1961. Dans ce cahier, dont l'usage est obligatoire, les enseignants doivent consigner les contenus des activités et les devoirs de la classe. La version numérique du cahier de textes peut être regardée par les enseignants, le personnel de direction et d'inspection, les élèves et leurs parents depuis n'importe quel ordinateur connecté à Internet. Ainsi, le dispositif est censé faire communiquer les différents acteurs appartenant à des espaces culturels et sociaux professionnels distincts, sans perdre l'autonomie propre à leurs mondes sociaux. Cela est définit par Trompette et Vinck (2009) comme « objet frontière ». Dans ce contexte nous nous posons les questions suivantes: le cahier de textes numérique est-il adapté aux besoins des usagers, venus de différentes cultures et mondes sociaux ? Quels sont les effets de l'intégration du cahier de texte électronique dans le milieu scolaire ? Comment analyser les effets des usages de la version numérique du cahier de textes sur les différents acteurs, en prenant en compte la spécificité de leurs cultures? Comment accompagner le processus d'innovation technopédagogique ? Parvenir à inciter les processus métacognitifs à l'oeuvre dans des résolutions de problèmes mal structurés constitue un enjeu important. Ces processus sont en effet requis mais rarement mobilisés de façon spontanée. Trois études ont été proposées, afin de vérifier les effets positifs de différents types d'incitations métacognitives sur l'émergence de régulations métacognitives et sur les performances à des problèmes peu structurés. Les résultats ont permis d'une part, de clarifier la nature et le fonctionnement des régulations métacognitives, exprimées sous la forme d'expériences et de prises de décisions métacognitives. D'autre part, il a été possible de circonscrire certaines conditions d'efficacité des incitations métacognitives proposées. Sur la base de ces constats empiriques, des réponses aux points encore en suspens du concept de métacognition ont été proposées. This thesis presents a framework for supporting interaction regulation through computational means. Regulation of collaborative problem-solving includes aspects related to the task as well as to the interaction itself. Task related aspects consist of establishing a strategy, planning actions and evaluating progress. Interaction regulation on the other hand refers to the organization of collaboration through communication rules as well as division of labor. These rules and strategies might be established at the outset of the collective activity, but they also need to be monitored and adapted as the interaction evolves. On a moment to moment time scale, regulating collaborative interaction consists of deciding "who does what" in addition to "what to do"
François Lombard, 2012 - Conception et analyse de dispositifs d'investigation en biologie : comment conjuguer autonomie dans la validation scientifique, approfondissement conceptuel dans le paradigme et couverture curriculaire ? L'investigation est un modèle pédagogique proposé pour conduire les élèves vers l'approfondissement en science. Cependant guider les élèves vers l'approfondissement dans le curriculum sans recourir à l'argument d'autorité reste une difficulté majeure. Nous avons conçu un dispositif d'enseignement basé sur un espace d'écriture partagé en biologie au secondaire supérieur, raffiné durant 10 ans. Nous avons analysé quatre années pour en extraire une conceptualisation, une description abstraite et l'identification de variables pertinentes, notamment la complexité épistémique. Dans une approche méthodologique "Design-Based-Research", nous avons analysé les traces des productions écrites d'élèves, des questionnaires en fin d'année et un an après à l'université. Nous proposons la distinction entre l'autorité pédagogique et l'autorité scientifique, ainsi que 27 recommandations de design éprouvées. Leur synthèse révèle l'interdépendance de la responsabilité assumée d'une partie des savoirs par les élèves, d'un but d'approfondissement partagé et le rôle des ressources authentiques pour guider l'affinage conceptuel des questions. Ce projet de thèse s'inscrit dans le sillage des travaux portant sur les dispositifs de formation hybrides , (notamment Charlier, Deschryver et Peraya, 2006) et dans la continuité de notre mémoire de master ainsi que des travaux menés dans le cadre du projet Hy-Sup (2009-2012). L'objectif de ce projet, auquel nous participons depuis octobre 2010, était de caractériser ces dispositifs de formation (Burton et al., 2011; Peraya et al., 2012) et d'analyser leurs effets sur l'apprentissage et l'enseignement, tels que perçus par ses différents acteurs (Charlier et al., 2012 ; Peraya et Peltier, 2012). Notre recherche portera sur l'influence, chez des enseignants de l'enseignement supérieur, de la conception ou représentation du média pour l'apprentissage sur le processus d'appropriation (Paquelin, 2009) du potentiel d'innovation des dispositifs hybrides. Ce processus d'appropriation se découpe en plusieurs étapes : 1) la perception du potentiel innovant, 2) l'intention d'actualisation, 3) l'actualisation selon différentes modalités et enfin 4) l'attribution des effets, que nous analyserons en termes de médiations (Peraya, 1993-2010). Site personnel. Dans le cadre de leurs cours, plusieurs formateurs des HEP de Suisse romandes utilisent un environnement d'apprentissage (eLearning). Ce dernier leur retourne un certain nombre d'informations sous forme de traces informatiques qui rendent compte des activités des étudiants. Par un questionnaire en ligne et une série d'entretiens individuels, treize formateurs ont été questionnés sur leurs usages de l'environnement d'apprentissage, leurs pratiques, leurs besoins et, en particulier, leurs besoins non-satisfaits. La liste des besoins non-satisfaits est alors croisée avec la liste de toutes les traces fournies par l'environnement d'apprentissage pour vérifier si ces dernières sont à même de répondre aux attentes des formateurs. Lorsque c'est le cas, un développement informatique est réalisé pour extraire du système les informations nécessaires aux formateurs. Ces informations sont alors organisées selon des critères d'ergonomie. Le développement est ensuite validé par un nouvel entretien individuel auprès du ou des formateurs concernés. Conférence EARLI Sig.2 : Du 11 au 13 juillet 2016, participez à la conférence « Learning from Text and Graphics in a World of Diversity » du groupe d’intérêt Comprehension of Text and Graphics.  Retrouvez le programme du dernier colloque organisé par TECFA: E-learning 3.0, quel avenir pour la formation supérieure ?